The White Horse is located in the heart of London on Newburgh Street, a short jaunt from Great Marlborough Street, Broadwick Street, Piccadilly Circus, Oxford Circus, a plethora of shops on Carnaby Street, and it’s only 12 minutes on foot from Bond Street Underground Station. Based in the epicentre of London’s 1960s counterculture scene, nearby you’ll also find the London Palladium, The Photographers’ Gallery and an abundance of beautiful gardens; Berkeley Square Gardens, Cavendish Square Gardens and Soho Square Gardens. 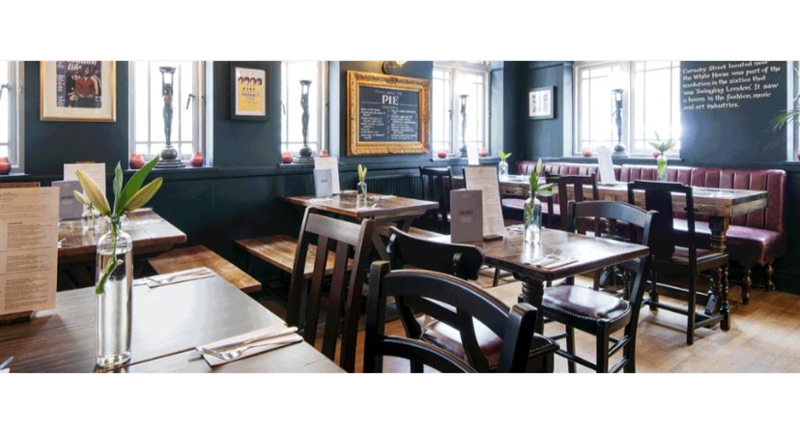 If you’re looking for a pub that offers the very best pub food in the heart of [enter location], then look no further than our speciality pie house, The White Horse, which serves a range of delicious pies under pastry or mash. Our location on Newburgh Street, is a short jaunt from Great Marlborough Street, Broadwick Street, and Carnaby Street, and only 12 minutes on foot from Bond street tube station. You’re more than welcome to come and try our seasonally inspired menu, or even just for a quick bar snack. At The White Horse, we’re proud pie connoisseurs, and you can be sure that’ll you’ll enjoy our pies. Why not complement it with a perfectly poured cask ale, a glass of fine wine, or even a taste from our extensive whisky and gin collections. We serve many local beers including Sipsmiths, Camden Hells, London Pride, London Lager and London Pale ale. Our range of eclectic range of refreshments includes unpasteurised Pilsner Urquell, which is delivered directly from Pilsen the the Czech Republic to our 4 large overhead tanks every week.